AMOUR is a typically austere, unflinching and technically formal Michael Haneke film. His camera faces the protagonists head on and does not move, refusing to follow the action off screen, waiting for it to return to the original set-up. As an audience, we are forced into that same immobility. We are forced to slow ourselves down to the pace of this film, to live inside the four walls of the apartment, and endure what the protagonists endure. They are an old married couple (Jean-Louis Trintignant, Emmanuelle Riva) , still sympathetic, still vital, until she suffers a stroke and a failed reparative operation. Promising not to take her to hospital again, and repulsed by the brusque carers, he takes on the burden of her care. We feel her anger and indignity. We feel his frustration and hopelessness. Their daughter (Isabelle Huppert) also suffers but her pat solutions seem distance from the reality of her parents' situation. As with all Haneke, a quiet tension builds until a provocative final resolution. It is a resolution that we have been guessing at and fearing since the prologue. That it comes as less of a surprise does mt diminish it's force. That said, I did not find this film as convincingly deserving of its Palme d'Or as Haneke's THE WHITE RIBBON. I felt that there was some repetition and tedium during its middle passage. Did we really, for instance, need so much time with Isabelle Huppert's character? Did we really need to see two nurses. The film also felt a little bit like it didn't know how to end, and the scene that was finally chosen seemed somehow "small" in the context of the powerful emotions that proceeded it. Still, Haneke that is not quite at the level of perfection of THE WHITE RIBBON and HIDDEN is still quality film-making, and after all we have something here That we do not see so often in his films, and perhaps in life: dangerously selfless love. 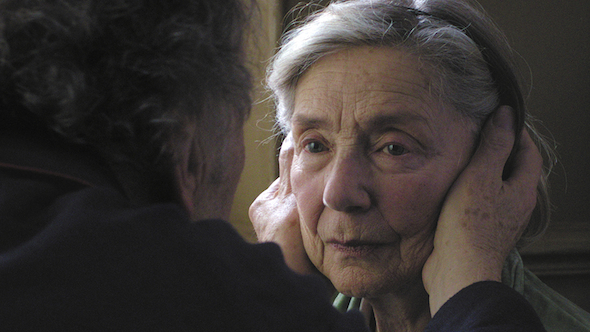 AMOUR played Cannes 2012 where it won the Palme d'Or, and London 2012. It opened earlier this year in Germany, Hungary and Greece, and opens on Oct 24th in Belgium, france, Russia and Italy. It opens in Poland on Nov 2; in the Netherlands and the UK on Nov 16; in Sweden on Nov 23; in Portugal on Nov 29; in the USA on Dec 19; and in Denmark and Norway on Dec 25th. The running time is 127 minutes.